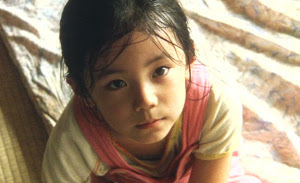 Based on the real life Sugamo child-abandonment incident of the late 1980's, "Nobody Knows" is the story of 4 children abandoned in a lonely apartment for months on end by their mother who had run off to be with yet another man. At first she seems pleasant and caring, but it's only an act. In fact, it's such an egregious act that we can only look at her with contempt. Her eldest son Akira (Yûya Yagira) looks at her with increasingly more doubt and anger, yet he fears to take action. Upon arriving at their new apartment, she introduces 12 year old Akira to the landloards as her only child, but after moving all their belongings in, they open suitcases to reveal two more small children, Shigeru (Hiei Kimura) an energetic troublemaker about 7 years old, and Yuki (Momoko Shimizu) the youngest at about 4 (on the verge of a birthday). Akira then runs to where they hid the eldest daughter Kyoko (Ayu Kitaura), who is too big to fit in any of their suitcases, so he can sneak her into the apartment too. Over dinner, the mother Keiko (played by Japanese pop star You) reminds the kids of the rules to keep from being kicked out again. Stay quiet, and only Akira can leave the apartment. She leaves early for work, and doesn't come home till late at night. Akira is entrusted with enough money to get some groceries with which he'll make their meals. Upon her return home Akira and Kyoko are expected to reheat her a bit of dinner and finish cleaning up before heading to bed. Akira warns Kyoko that he can smell the booze on mother, yet no amount seems to be enough to keep her from portraying herself in a friendly manner to the younger ones. The act fools them, but Akira knows better. Eventually she leaves and doesn't come back for days at a time. These disappearances become more regular and her returns increasingly harder to predict. During one of her lengthy absences Akira turns to a couple of her ex-boyfriends for help as his funds grow thin. The first, a cab driver, doesn't say much, but seems to note the resemblance between himself and Yuki. The next ex-boyfriend gives him a bit of cash, while trying to assure Akira (and himself) that he's not Yuki's father. While it's obvious all the kids have different fathers, the indication here is these most recent boyfriends overlapped and no one is sure who the father is. Neither of them make attempts to inquire about them later on, but their interactions with Akira don't lead us to believe they'd care to know. Keiko confides to Akira that she's fallen for yet another man, and this time she hopes it'll last, and they'll all be able to move somewhere together. Yet Akira has heard this all before. He regards her with a skeptical gaze despite remaining quiet. He and Kyoko beg her to enroll them in school, but she claims they'd be better off enjoying their freedom. We realize, particularly for Akira and Kyoko, they're getting old enough that without school they'll face serious trouble making a life for themselves beyond this lonesome hell. Eventually, Keiko disappears for good. Akira makes multiple attempts to reach her on the phone, but each attempt fails. He gets support from a friendly convenience store worker or two that give him food to take home to his hungry siblings. One of them asks him if he could just go to child protective services, but he's tried that before. He's not willing to get split up from his brother and sisters. Even if they have to wallow in poverty for the rest of their lives, they'll do it together rather than separate, even if it means a better life. Akira befriends Saki, a girl who's the exact opposite of them. She is enrolled in school, but doesn't go much. She gets bullied by other girls at school, and avoids home life for reasons unknown. She wants freedom, while Akira and his siblings have nothing else, and crave the structure she so callously casts off. She is, however, willing to help them however she can, even if it means offering herself to older men for money. When she gives the money to Akira, who recoils in disgust. "We only sang karaoke," she claims. Akira isn't so easily fooled. Yûya Yagira plays him smart and confident despite their overwhelming odds. Koreeda, the director, doesn't give him much dialogue, choosing instead to observe and react. In Richard Linklater's "Boyhood" we saw Mason as a child taking things in, in similar fashion. At first we wonder why there's so little reaction, before remembering that kids act this way. There's so much of the world they don't know about, that everything is new. They lack the perspective to fully realize the gravity of the situations they're living. Here, Yagira's performance is in the eyes, and his subtle reactions to what goes on around him. The filming took around 18 months, and he grew some along the way. His voice even cracks at times, a point which they acknowledge in the film. Ultimately his performance was lauded with an award for best actor at Cannes. One of the happiest moments is when Akira takes the chance of allowing his younger siblings a temporary jailbreak from their imprisonment. They all run free for the first time in months, having survived being cooped up in a small apartment all through the cold winter months, and now the hot summer months. The escape is a necessary one once their water, and electricity is shut off due to overdue bills stacking up. It's also necessary for the audience to witness some happiness after so much despair. The title "Nobody Knows" suggest many things. No one knows that the younger children exist, or how they'll manage to get by, but no one knows where their mother is, or if she'll ever come back. It feels as meandering as the unstructured lives of unobserved young kids should, yet there's something captivating about it. Akira treats his siblings with love and respect, and the ways in which he sacrifices to take care of them is both heartbreaking and heartwarming, often in the same scene. The persistent question we wonder is how long this can go on. Certainly the landlord should notice once the rent checks stop coming in. Koreeda doesn't explore it any further. It's left as unsure for us as tomorrow is for these kids.